Over 18: K Paul to Pandya, single, Karthk takes one, Krunal takes two as he pulls it to fine leg, flicks the next ball and boundary off it, India just need 2 runs to win the match, and he gets two to ccovers!! India win the first T20!! 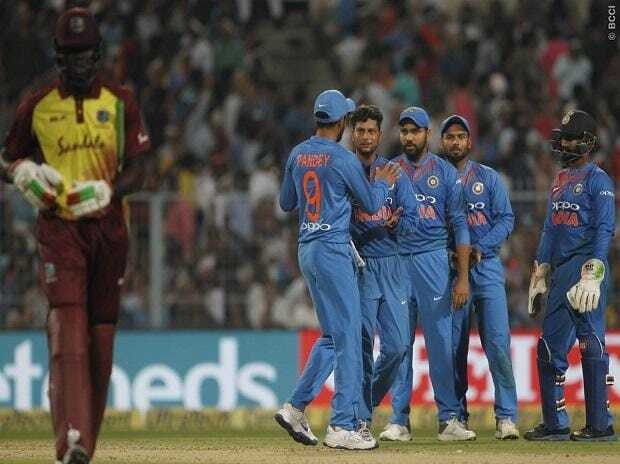 Over 17: Pierre to Karthik, appeal for edge, Windies go for review but it did not help, Karthik takes one, Pandya plays the next ball well and fine and gets a boundary to third man, single comes off the next, 100 runs up for India, India needs 10 more. Over 15: Pierre to Karthik, singles off the first two, dot ball and another single by Karthik, OUT!! simple catch and Pierre takes the catch, Manish Pandey is dismissed! !